Are you planning some ice water fishing for your next angling trip? If you’re an experienced angler you already have your fishing tackle for open-water fishing, so what are the difference in the equipment when going to ice fishing? Clearly, you need to find the fish, to put a fishing lure in front of them and you need to make them eat it. There are, of course, some differences and I’ll be happy to share them with you. 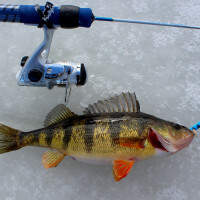 Usually, fishermen use a rod and reel for ice fishing, but the ice-rod should be shorter compared to the one you would use for open-water fishing. Next thing you should have on that reel is some line, which you’ll attach to the lure. When choosing a line for ice water angling, there are things you should consider that you normally (for open-water fishing) wouldn’t. In open water, the fish hasn’t got enough time to check out the lure completely, while in ice water it can look at your lure for quite a long time. Line visibility, therefore, is a greater factor when you’re ice-water fishing. In addition, you should look for a line that is designed to perform well in cold weather. Furthermore, sharp edges of an ice hole can damage the line. Yes, the line can be damaged be rocks and weeds, too, but the jagged edges of ice holes can actually destroy your line. What else do you need for enjoyable ice water fishing? Durable and warm boots are your top priority, as well as warm (waterproof) clothing. Also, you’ll need a bucket (you can use it as a seat and as a bait bucket), ice cleats, ice auger or chisel, ice safety picks and ice scoop. Of course, it would be very wise to take a fully charged mobile phone with you.